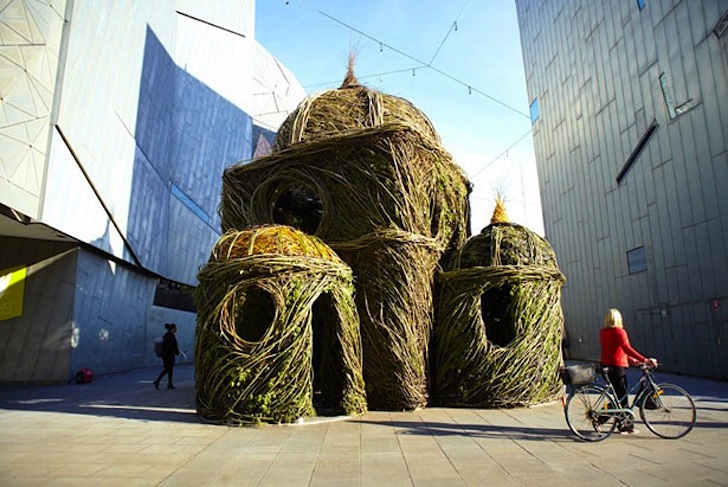 By now, just about everyone is familiar with Patrick Dougherty's enormous nests made of willow saplings, but his latest "Ballroom" installation at Federation Square in Melbourne might well be his most ambitious yet. Willows are considered weeds in Australia, where their dense canopy, invasive root system and excessive leaf fall is destructive to local water systems - but the plants offer a great medium for the American artist's larger-than-life public art installations. For the Ballroom installation commissioned by the Federation Square Creative Program to promote public art at the 3.2 hectare mixed-use space near Melbourne’s busiest railway station, Dougherty turned to the nearby St. Paul’s Cathedral for inspiration. 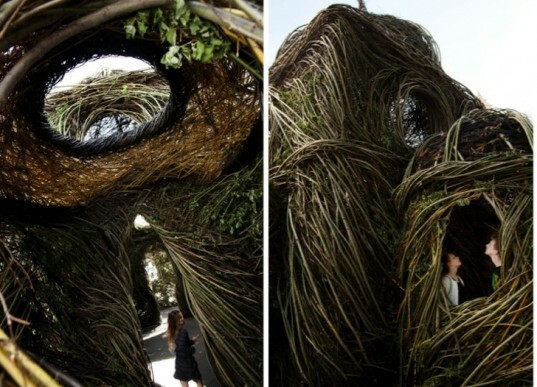 Apart from metal scaffolding that keeps the willow structure erect, the artist uses few tools to prunes and bend the malleable branches to his visionary will. It took three weeks and 10 tons of willows to realize Ballroom, which features magical arched ceilings and celestial windows that permit just a smidgen of daylight to penetrate the interior. This particular piece on show until early 2013 helps the Australian government manage the arboreal pest in a way that is both aesthetically pleasing and awe-inspiring.